The SA Tennis Open, an ATP World Tour 250 tennis tournament, is returning to the ATP World Tour circuit for the first time since 1995. And Jo-Wilfried Tsonga is the favourite player to win at this tennis tournament. “I know there is Marcos Baghdatis and David Ferrer to watch out for this week. 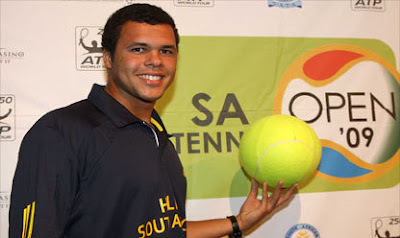 They are good players but I’m here to get through the draw and go all the way,” Tsonga said. Born in Le Mans 23 years ago to a French mother and Congolese father, Tsonga says his appearance at the Montecasino entertainment centre in Johannesburg is a “homecoming”. Tsonga will play against Brazilian Thiago Alves in the first round. 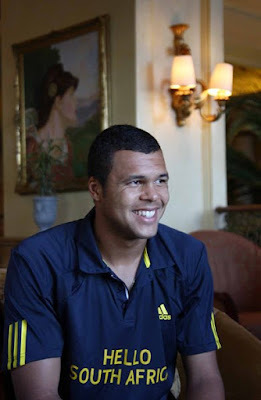 Here are some pictures of Tsonga in Johannesburg.